The new home of the latest additions to the Curraghs Wildlife Park is officially open. 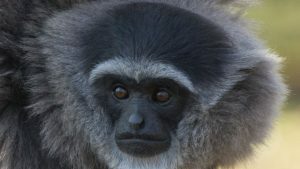 The Lieutenant Governor was the guest of honour at the opening ceremony of the enclosure for silvery gibbons Slamet and Nakula, who arrived at the park in July as part of a breeding programme. The facility has taken two years of work and includes a rope bridge, heated house and island. David Cretney MLC, Member of DEFA with responsibility for the Curraghs Wildlife Park; Kathleen Graham, the park’s General Manager; His Excellency and Lady Gozney; Richard Ronan, Minister for Environment, Food and Agriculture, and Kim Etherton, Chairman of the Friends of the Curraghs Wildlife Park, at the silvery gibbons’ enclosure. His Excellency – a keen conservationist and trustee of the UK’s Orangutan Foundation – visited the animals first as he toured the 24-acre park in Ballaugh with Lady Gozney. 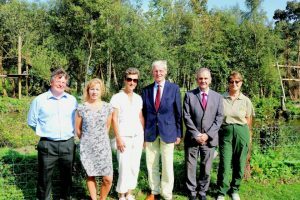 They met park staff and members of the Friends of the Curraghs Wildlife Park, a registered charity that supports the work of the attraction and contributed £30,000 towards the cost of the gibbons’ enclosure. His Excellency said the programme is an excellent achievement for the island’s global outlook on endangered species. The park’s general manager, Kathleen Graham, told MTTV she’s hoping there could be another new arrival in the near future: [play audio below].